Club Med Kani is on the east side of the North Male Atoll. This Club Med in Maldives is a paradise where the ambiance of the Club leaves no wishes unrealized and offers fun, sports, games and activities all day long. For those who want to relax, the long stretch of beach is the perfect place. The turquoise lagoon surrounding Kani Island is nice for snorkeling, swimming and learning scuba diving. With its 5 stars water bungalows, this Village is one of the best Club Med you can find. The mouth-watering and splendid quality buffet for which Club Med is known for during lunch and dinner ensure a Club Med holiday of a lifetime. Club Med Kani is on the border of the atoll and offer a large choice of dive sites. For divers who wish to explore some of the best dive sites in the Maldives. H.P. reef and Nassimo Thila are covered with soft corals and magnificent black corals. The overhangs and the huge reefs all over these dive sites make this place even more special. They are some of the most famous reefs in the North Male Atoll and are only a short boat ride away. There are several channels and outside reef close by the resort offering spectacular drift diving with large schools of tuna, jack fish, turtles, eagle rays, sharks and napoleons. From May to November, Lankan is one of the best place on earth to see the manta rays. These graceful creatures like to come every year to this cleaning station at only 25 minutes away from your hotel. More than 15 world class dive sites are reached within 5 minutes to 1 hour boat ride away from the island and our friendly crew will make it a pleasure to go on any dive trip. Start now! A great way to save valuable holiday time in Kani Maldives! One of the 15 Protected Marine dive sites of the Maldives. Located in North Male’ Atoll south of Girifushi Island. It is best recommended to dive here with a small or a medium current as the site is not big enough to drift along for an entire dive. With out going currents divers may start the dive jumping in the blue and drifting with the current towards the Reef while keeping with the left hand shoulder to it. The top of the dive site can be a spectacular place to be as the pelagic tend to hunt here; It includes Tuna, giant trevally with schooling big evey trevally and also eagle rays. As you drift in you will come across a butterfly shaped rock with overhangs reaching depths of 25-30 meters. Under the over hangs it is really beautiful with red soft corals on the ceiling. In this overhang you can see a chimney-like formation; while keeping on drifting you will come across more coral outcrops and overhangs at depths ranging from 18 to 25 meters. As you ascend shallower you will find the top reef colonized by many Sea Anemone clown fishes. Large coral and good fish life makes it ideal for divers to spend the end of the dive on the top reef. Care should be taken while diving on this site which is more recommended for advanced divers with good buoyancy as the coral is very fragile and with strong currents it can become a tricky. 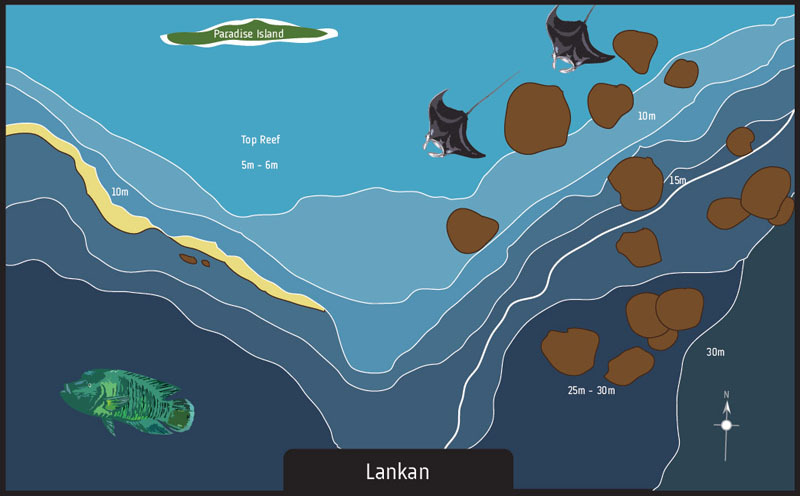 The site is towards the southern part of the main reef of the Island Lankan Finolhlu. The top of the reef is at an average of 12 meters of depth where it slopes down to the bottom to a depth of 25-30 meters. With an ingoing current you could start the dive while keeping the reef to the right hand shoulder. You have the possibilities to see white tip sharks and hawks bill turtles. Towards the south corner the dive site become exciting as there are a lot of red snappers and giant trevally. But this is during the months of May until November that the dive site will offer you its best: a lot of zoo plankton gets carried to the reef due to the reef configuration there is a “cleaning station” where the Manta Rays are often present. With care the divers stop around this cleaning station and can see the Manta Rays being cleaned while 1, 2, 3 or 4 are behind waiting for their turn! The manta ray is coming near the top of the cleaning station and is hovering at around 40 centimeter from the reef. Dozens of Cleaner Wrasse are then doing their ”duty” by removing the parasites and the old skin from the rays. After a few minutes, the ray is “taking off” and the next one is coming making an unforgettable scene for every diver. This process last for several hours and therefore, the diver must have a look at his pressure gauge as the diver can be completely captivated by the scene! From time to time whale sharks have been spotted here often during the season. 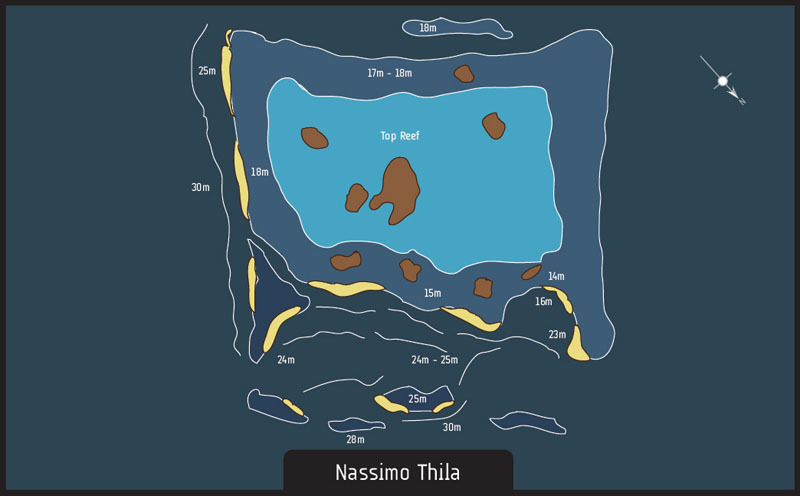 Nassimo Thila is a reef which stretches around approximately 150 meter in an oval shape and where the average depth on the top reef is in-between 10-15meters. The shallowest part on the coral blocks top to about 15 meters and drops towards the blue to 30 meter below. By the side of the main Thila are over hangs which are covered with blue soft coral and huge sea fans. Schools of blue line snappers and oriental sweet lips are a common inside the overhangs often stingrays can be seen resting under the small overhangs. The site could be done with a medium current making it a dive site favorable for the open water divers as well as advanced. Nassimo Thila is definitely one of the best dive sites in North Male Atoll. The site consists of three main large sections of the reef; a reference line is attached to a hole on the reef at 13 meters. The reef is healthy in coral life and divers can observe tuna, white tip sharks and a lot of banner fish. On the main section of the reef both sides have overhangs at depth starting from 18 to 30meters. he dive can be conducted like a spiral around the reef. small current is recommended as always in either out going currents or ingoing currents the site will always be done half with the current and the other half against the current. 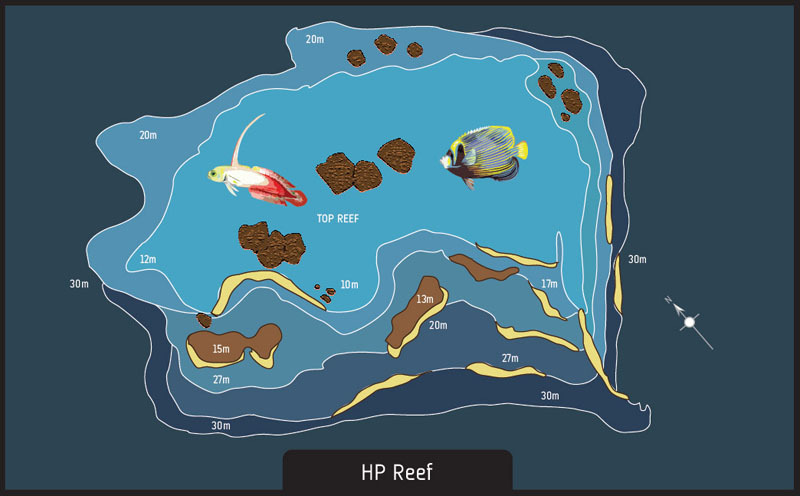 Banana Reef, named after the C-shape of the reef is around 100 meters in length. The reef is in front of the channel where fresh current enriches the reef with plankton it carries attracting also pelagic. The most exciting part of the reef is at the northeastern side of the reef where big spectacular rocks starting from a depth of 30 meters rising up to 12 meters below the surface. Schools of Banner fish can be seen just at the start of the dive, a lot of hunting takes place in this area of the dive site where dog-toothed tuna and several species of Jackfish can be seen chasing their next pray. As you drift in you will come across some caves and gutters and a series of overhangs. 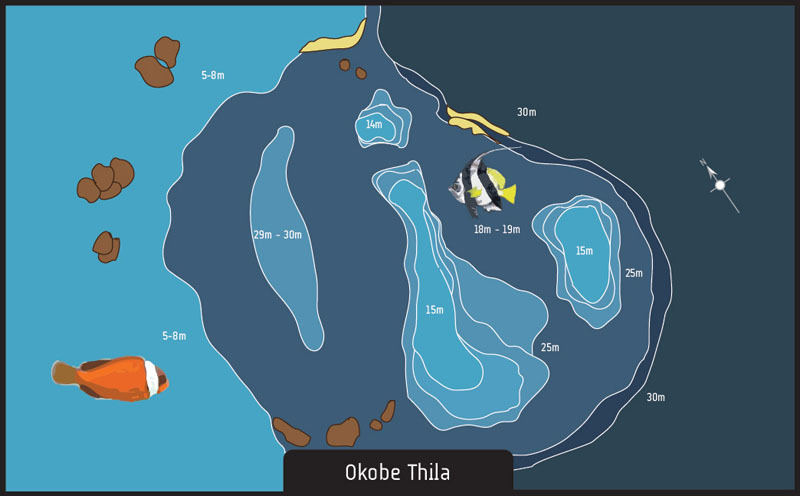 This area of the reef slopes down and after few minutes you will drift in the biggest overhang in Banana Reef where the top starts at 10 meters and drops to 20meters. This overhang is fully covered with soft coral on its ceiling and for the pleasure and amazement of the divers, a huge school of Blue line snappers is always inside letting you approach them very closely. 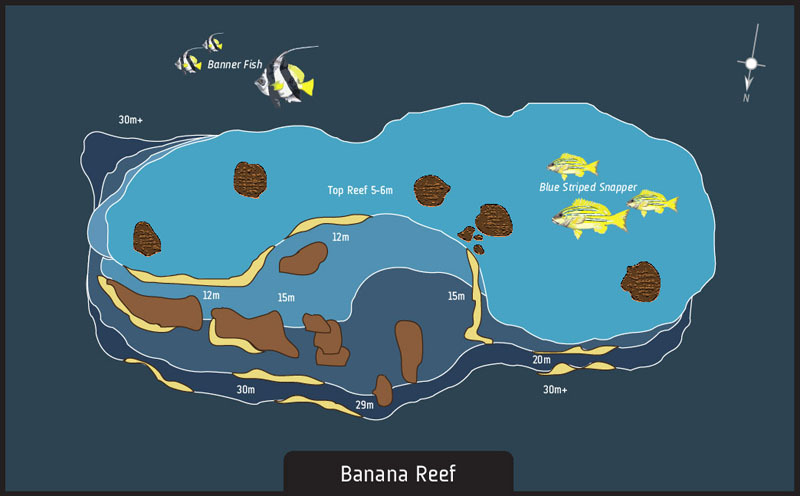 Banana Reef is ideal to do with a Small to a medium current but can become tricky as the current stream increase. It is both suitable for beginners and the most experienced divers and is a photographers’ heaven. The famous French movie the Big Blue boasts some screen shots of the dive site. Located at the North end of Full-Moon Resort. With ingoing currents divers can begin this dive before the north end corner of the Full Moon out side reef. 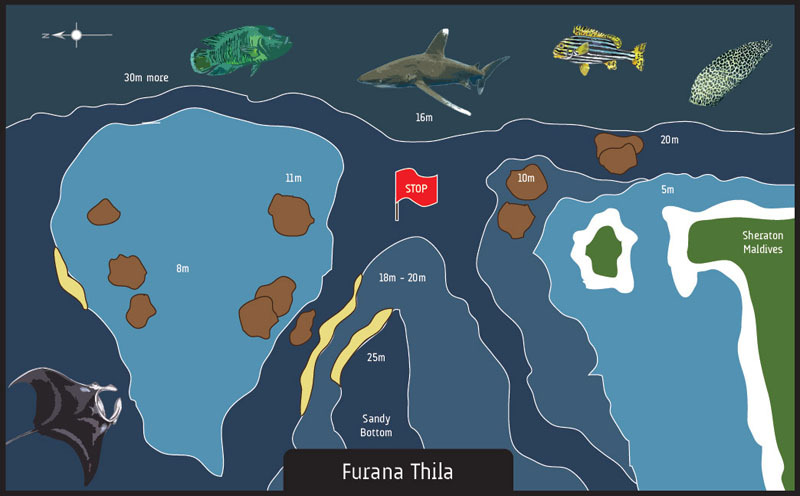 The idea of this dive is to cross a small channel which is about 20 meter in length and cross over to the Thila where the top of the reef is about 12-15 meters deep and slopes down on both sides to 25-30 meters. The most exciting part of the dive is at the start while drifting keeping the reef to the left hand shoulder with the current towards the channel. You can encounter many pelagic fishes such as Dog-Toothed tunas in packs, giant trevally hunting in the blue, white tips sharks riding the current and huge schools of fusilier fish. The excitement keeps increasing when you will encounter small to big sized Napoleon fish and gliding eagle rays. Do expect to see a lot of fish life over here with a lot of table coral and thousands of tropical fishes. While drifting closer to the corner of the reef divers should monitor their buoyancy as the currents can be strong. After crossing the small channel you will arrive at the top of the Thila as interesting as the side of the reef which slopes down. There are a lot of Mushroom corals in this dive site and many divers have observed nurse sharks resting under these enormous rocks. The site is more suitable for experienced divers when there is a medium current and for beginners with a small current. This is an exciting dive site during the months of September until mid November as manta rays can be often seen during the dive.